If you share posts related to coding in your blog, then you must use the html code box in your blog post. Because this will show your code separately from your blog post, so that visitors of the blog can also copy the code easily. It also gives a professional look to the blog, and the blog's design is also good. So in today's post we will add you to the Html Code Box Blogger Blog Post. ) is going to sender with complete information about how to pronounce. 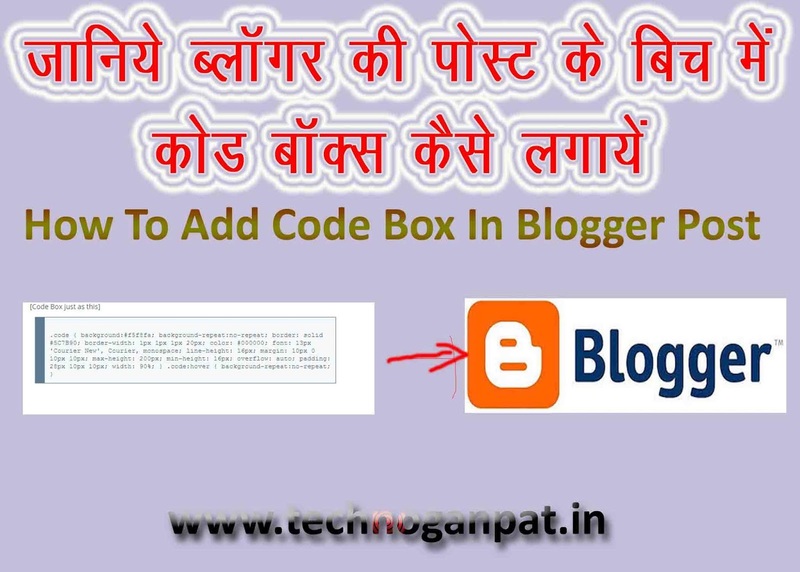 In this post I am going to give you the information about adding HTML code box to the blogger's post in the most simple and easy way. This post has information about 2 types of code box, which is simple code box and stylish colored code box. You can use any type of code box in it with your choice. You have to follow the simple steps below. This step is very easy. So let's start it. Now, in the post of your blogger blog that you want to add or apply the html code box, go to the editor page of that blog post and click on the HTML option, clicking on the HTML will open it in the blog post html form. Now in the place where you want to add the html code box in the blog post, paste the code copied from the code box at the top. In the place where the Techno Ganpat is written in the code, you should remove TECHNOGANPAT and paste your code there, The code you want to add to the post i.e. the code you want to share. Principles to click on compose, have missed you will have the html code box add in your blog post. So with the code box, you can easily share coding of css coding, java script etc as a blog post with your blog visitors. This will allow visitors of your blog to easily copy the code. This will not have any problem in reading them blog posts. Because if we share coding without any code box, then visitors can have trouble reading the blog post. If you have any problems related to today's post, you can comment by commenting to us. We will help you in every possible way. If you want to get free through similar blogging tips and updates email, Be sure to subscribe. Today, in this Html Code Box Blogger Blog Post, please add the post with other bloggers.